The Ultra Cut Compound isn’t a finishing polish like most products I’ve featured here but rather it is a compound designed to remove severe oxidation and swirl marks but it will leave some light scratches on the paint that will need to be removed by a finishing polish so in essence this product can’t be used as a stand-alone product. 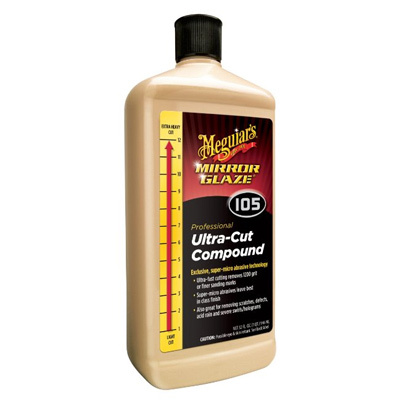 This product is the most aggressive in Meguiar’s “professional” product line with a rating of 12 and is meant to be used with a rotary but can be used with a more user friendly polishers like the porter cable or the DACP if the paint is soft enough. It is designed to remove marks left behind by a 1200 (or more) grit sand paper, this process is called wet-sanding – you can read more about it here. It is important to know how a product works so expectations won’t suffer because of false expectations, so it is important to know (specially for this product) the exact purpose of the product. Car enthusiasts love how this products takes off severe oxidation and swirl marks but you have to know how much of this product to use and what type of pad to use it with to be able to see great results. Important Note: Before applying wax or sealant be sure you’ve prepped the paint, doing this gives you a clean surface for the wax or sealant to bond to and this will maximize the protection it gives, your car will also have a better shine. If you haven’t read our guides on how to wash, clay and polish, please take the time to do so, it takes a bit more effort but it will be worth it in the end. The to getting the most out of this product is combining it with the proper tools, on softer paints you can use this with a less powerful machine like the porter cable or the DACP, but on hard paint you’ll need to use a rotary to be able to really break down the micro abrasives to cut through and polish the oxidation, swirl marks and other paint defects. Remember though that there is a learning curve in using the rotary, use it the wrong way and you’ll burn off the paint. So if you aren’t experience, practice first on something else other than your vehicle. For the most severe paint defects use this with a wool pad like this but on moderate defects you can use it with a less aggressive polishing pad or cutting pad. Work on a small area first with the least aggressive product first to see if it is strong enough to remove the scratches. You don’t need to use a lot to get the best results, one trick professional detailers use is using a squeeze bottle to store the compound so that it’ll be easy to apply it on the paint. If you use a lot, it can be difficult to remove afterwards so there will be a bit of trail and error involved in knowing how much of the compound you’ll need to use. Remember with this product, less is more, if you use the right amount – it will be easier to remove and there will be less dust afterwards. When used with the right pad and machine, the results are stunning – almost a mirror like shine but you’ll still have to polish the paint with a finishing polish to take off the micro scratches that this product will leave behind. It cannot be used alone without the finishing polish. Like what I’ve said numerous times in this reviews – it will takes out severe swirl marks and oxidation as long as you use the right tools and technique. If you can’t take off the swirl marks using a consumer grade buffer like a porter cable, move up to a more powerful rotary but remember that you have to learn how to use this machine properly so you won’t burn the paint. Since this product is marketed to professional detailers, it is a bit more expensive than consumer grade products. This product can’t be used without a finishing polish, so you’ll have to spend at least a day to compound, polish and wax which is a bit time consuming but when you’ll see the results, it will be worth all the effort you put in. Most people who use this products and left a review, either have a detailing business (full time or on the side) or just plain car fanatics. There aren’t a lot of negative reviews, only two or three but their reasons for not liking this product are pretty vague and not well explained. Pro grade products like this aren’t readily available at your local stores but the good news is that Amazon has these on stock so Check it out and get free shipping if you register with the Amazon Prime program. You are a car nut obsessed in keeping your car looking as sharp as possible, or you just want to restore your car’s beat up paint, or you are a detailer by profession looking for a product that will take out severe paint defects on some of your client’s cars. Regardless, this product will work wonders especially on darker paint finishes where severe oxidation is more glaring and visible. Combined with the ultimate finishing polish, it will bring back the luster and shine of your car’s finish. I have a ’92 Black Jaguar with a clear coat application over good paint. I have the car street parked as I live in the city. For the first few years after the restoration the car was in a private lot with good protection from direct sunlight.. However, after 7 years the car is exposed to the elements and depending on location sometimes gets extended periods of sunlight. I detail the car every spring and summer. The elements here in Chicago are severe, so there has been oxidation. I use Mequiar products pretty exclusively on clear coat finishes and Blue Magic on single enamel coat repaints. I used this product for the first ime in 2014 and was extremely pleased with its performance followed by the new Meguiar’s black crème polish. I was really happy with he results considering that the original paint is now 22 years old. Copyright text 2015 by Clean Your Car HQ.